Summer is officially upon us. With that comes the sound of a game at the K, fun at the lake, a barbeque with friends, traveling with family and the 100 deadliest days on the road. That’s right we have entered the most dangerous time of the year on the roads. More startling it is the most dangerous time of the year for our youth. The summer time is the deadliest days for teen drivers. On average about 1,000 drivers will be killed in a car accident each day this summer across the nation. Over half will be teen drivers. This is according to National Highway Safety Administration research. Some of the main reasons for teens to have a spike in accidents during the summer are due to school not being in session. There is more time to be on the roads trying to enjoy their time out of the classroom, the number of years a driver has had behind the wheel and the distractions of technology and friends in the vehicle. The reasons a driver could get distracted is due to other passengers being in the vehicle. According to the NHSA, when a teen driver has passengers in their car, they are 44 percent more likely to be involved in a fatal accident. In Missouri the law states that a 16 year old driver can only drive with one passenger under the age of 19 until they have been driving for six months. After their six month mark of driving the driver could then have up to three passengers in the vehicle that are under 19 years of age. The intermediate driver is not allowed to drive between the hours of 1 AM to 5 AM unless they have a licensed driver over the age of 21 with them. In Kansas the law states that a 16 year old driver can drive anywhere between the hours of 5 AM and 9 PM. They can also drive anytime going to work, school or any faith based activity. The driver can only have one passenger in the car with them that is under the age of 18. Once the driver has six months of driving or they turn 17 all restrictions no longer apply to the driver. Most states also have laws about texting and driving for drivers that are under the age of 21 and for Commercial Drivers. In Missouri the fine for texting for a driver under 21 is $200. The laws in Kansas are a little different than Missouri’s. They state that drivers may not write, send or read a written communication via a wireless device unless: the driver is in law enforcement and conducting work related business, the driver is stopped, reads the text message and selects or enters a phone number in the purpose of calling the person back, receives an emergency, traffic or weather alert or is receiving a message due to the navigation of the vehicle (GPS). The fine is $60 for anyone that is not following these laws. Laws are in place to keep drivers safe. We are in the 100 deadliest days of the year. We focused mostly on teenage drivers due to more accidents during the summer time having teen drivers involved. 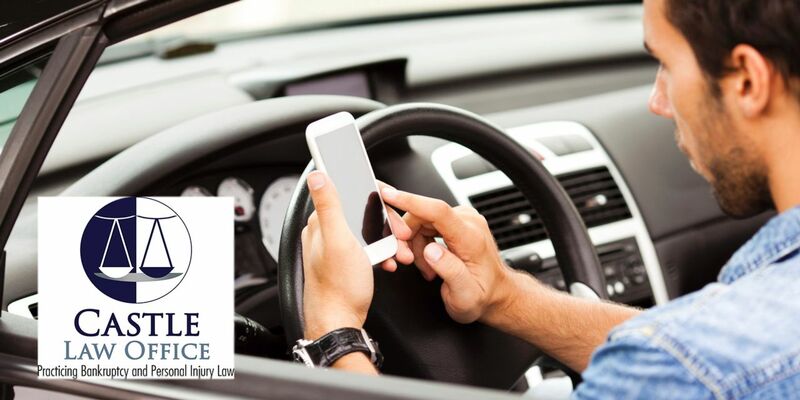 If you have been injured in a car accident due to someone being distracted or not following the rules of the road call Castle Law Car Accident Attorney’s at 816-842-7100 or contact us via email.